Over the last several decades, Virginia Beach has been transformed from a sleepy vacation town to the largest city in the commonwealth. Its Jewish community has likewise evolved from a small summer outpost of the larger Norfolk community to become arguably the center of Jewish life in the Virginia Tidewater region. Incorporated in 1906, Virginia Beach began to develop once Virginia Beach Boulevard was completed in 1922, linking Norfolk to the oceanfront. Summer homes and posh resorts like the Cavalier and the Princess Anne Hotel, both of which excluded Jews before World War II, sprang up along the beachfront. The well-to-do of neighboring Norfolk would often spend their summers in Virginia Beach in an attempt to enjoy the surf and beat the heat. Nathan and Blanche Polis, who owned a furniture business in Norfolk, bought a house in Virginia Beach. Observant Jews, they would hold daily minyans in their Virginia Beach house during the summers by the late 1940s. On the Sabbath, they would host an oneg reception after services. By 1949, these Shabbat gathering were attracting between 60 and 75 people, more than the Polis house could hold. Due to this success, Nathan realized that Virginia Beach could support its own Jewish congregation. In the summer of 1949, a group of 21 men established Temple Emanuel, and set about to acquire land for a synagogue. Algy Cohen was the congregation’s first president. By then, the group had outgrown the Polis home, and they held their Shabbat services at the chapel at Fort Story and later at the Virginia Beach Community House. The congregation acquired land at the corner of 25th Street and Baltic Avenue, and Polis and Jack Stein worked to raise the money for a synagogue. Polis, head of the fundraising committee, received most of his donations from other Norfolk Jews. 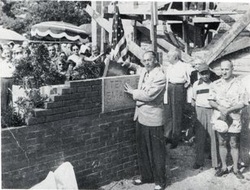 In August 1950, they held a cornerstone laying ceremony in which local Christian ministers and Mayor W.F. Patton took part. In 1951, they dedicated the synagogue in a ceremony featuring Rabbi Paul Reich of Temple Beth El in Norfolk and Rabbi Murray Kantor of Agudath Achim in Suffolk. The building was modest, with a multi-purpose room that was used as both a sanctuary and a social hall. ​With about 30 families at the time of the dedication, Temple Emanuel reflected a partnership between summer residents of Virginia Beach and the small but growing year-round population. Of the 21 charter members, a majority lived in Norfolk during the non-summer months, including the “founding father” of Temple Emanuel, Nathan Polis. Nevertheless, Temple Emanuel was a year-round congregation, holding daily minyans and weekly Shabbat services even during the winter months. Over time, the number of full-time Virginia Beach residents grew as the city increasingly became a suburb of neighboring Norfolk. Most of Temple Emanuel’s early members were retail store owners although a handful were professionals, including dentists and optometrists. As the first congregation in Virginia Beach, Temple Emanuel was formed more for geographical than ideological reasons. Members came from diverse religious backgrounds, and the young congregation decided to affiliate with the Conservative Movement as a compromise between its Reform and Orthodox members. Temple Emanuel was always flexible when it came to ritual matters in an effort to maintain unity among the membership. In its early years, Temple Emanuel relied of lay people to lead services, although they would bring in a visiting cantor for the High Holidays. By 1953, Temple Emanuel had 75 families and was able to hire its first full-time rabbi, Myron Kahn, who stayed less than a year. The congregation had a series of short-lived rabbis until 1962 when they hired Rabbi Philip Pincus, who led Temple Emanuel until 1976. Religious education was a top priority for Temple Emanuel, and a Sunday school was established soon after the congregation was formed. Its twenty students met at the Virginia Beach Community House in its early years. Once the synagogue was completed, it didn’t take long for the school to outgrow the building’s two classrooms. The Sunday school began to meet at a local public school. In 1958, Hyman and Rebecca Batleman donated land across the street from Temple Emanuel to construct an education building. It took several years to raise the money, but the new structure was dedicated in 1966. By 1974, Temple Emanuel had about 200 families, and the members voted to expand the education building, adding a new social hall, kitchen, and offices. At the same time, the congregation also remodeled their original building, transforming the multi-purpose room into a dedicated sanctuary. Much of this project was paid for by the proceeds from a weekly bingo game the congregation ran at the Virginia Beach Dome for eight years. From the beginning of Temple Emanuel, the Sisterhood played a crucial role in the congregation. With Mary Cohen as its first president, the Sisterhood sponsored a community seder each year that was held at Fort Story initially since their synagogue was too small to accommodate it. The Sisterhood raised money for Temple Emanuel with various fundraisers, including semi-annual rummage sales. They also managed the synagogue’s gift shop and kosher kitchen, preparing the food for synagogue events. The women of Temple Emanuel also took part in the leadership of the congregation. In the early 1960s, Bertha Chenman became Temple Emanuel’s first female president. During Rabbi Pincus’ tenure, women were allowed to take part in the service from the bimah and bat mitzvah ceremonies became commonplace. Temple Emanuel continued to grow in the 1980s. They started holding High Holiday services in a rented space since their sanctuary was too small. In 1987, the congregation built an addition to their original synagogue, adding a large social hall that could be used for Rosh Hashanah and Yom Kippur services. They also remodeled their education building, adding new classrooms and increasing office space. Rabbi Arnold Turchick led Temple Emanuel from 1978 to 1988. In 1963, Virginia Beach consolidated with surrounding Princess Anne County, setting the stage for Virginia Beach’s emergence as the state’s largest city. Between 1940 and 1990, the city grew from 20,000 people to 393,000. By the 1960s, more and more Norfolk residents were moving out to the new suburban developments in Virginia Beach. The construction of an interstate linking the two cities made traveling back and forth easier. In addition, a growing number of retirees from around the region were settling “at the beach.” The Tidewater Jewish community was reshaped by these demographic trends. In 1974, over twice as many Jewish households lived in Norfolk than in Virginia Beach. A 1982 study of the Tidewater Jewish community found “a rapid rate of movement to Virginia Beach” and estimated that 6650 Jews lived in the city as compared to 7400 in Norfolk. During the 1990s, Virginia Beach passed Norfolk. By 2001, Virginia Beach had the largest Jewish population in Hampton Roads and was almost twice as large as Norfolk’s Jewish community. For over 30 years Temple Emanuel was the only Jewish congregation in the city, but the growing number of Jews living in Virginia Beach soon resulted in the establishment of new congregations. In 1982, eight families founded Beth Chaverim (House of Friends), Virginia Beach’s first Reform congregation. After meeting in members’ homes, the group held their first public service at a local Methodist Church in the summer of 1982. They then spent ten years meeting at a Catholic Church while holding their Sunday school at Virginia Wesleyan University. 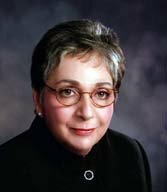 Although they didn’t have a building of their own Beth Chaverim joined the Reform Movement in 1984 and hired Rabbi Israel Zoberman the following year. In 1989, they bought land, and dedicated phase one of their synagogue seven years later. They had 195 families at the time. The new building had a multi-purpose space which the congregation used as a social hall and sanctuary. In 2006, Beth Chaverim added a sanctuary and a new religious school wing to the building. In the 1990s, members of Temple Israel in Norfolk decided to form their own Conservative congregation in the Kempsville section of Virginia Beach. Known as the Kempsville Conservative Congregation, or Kehillat Bet Hamidrash in Hebrew, the group. A member of the United Synagogue of Conservative Judaism, KBH has a chazzan instead of a full-time rabbi. In 1998, a group of Jews founded the Tidewater Chavurah in search of a more close-knit and informal religious experience. In its early years, the Chavurah would bring in student rabbis from the Reconstructionist Rabbinical College to lead services, though recently the group has relied on lay leaders. The group holds Shabbat services in members’ homes while meeting for the High Holidays at the Jewish Community Center. Jews have played an important role in the development of Virginia Beach. Most notably, Meyera Oberndorf served as mayor of Virginia Beach from 1988 to 2009 after spending 12 years on the city council. She was not only the city’s first female mayor, but also its longest serving chief executive and first to be directly elected. In 2008, at the end of her 20-year tenure, the city renamed its central library after Oberndorf. Jews have also been leaders of the business community, although often they had started their enterprises in Norfolk. Sam Sandler owned a wholesale food company that was eventually sold to the Sara Lee Corporation. His sons Steve and Art Sandler were involved in real estate development and became major philanthropists. The new JCC in Virginia Beach was named in their honor. Ellis Streilitz bought the Haynes Furniture Store in Norfolk in 1930. Following regional trends, the Streilitz family moved the business to Virginia Beach in the 1970s, building an enormous 300,000 square foot store. In recent decades, the center of the Tidewater Jewish community has shifted westward to Virginia Beach. This trend toward suburbanization was solidified in 2004 with the establishment of a centralized Jewish campus in Virginia Beach. Though it is located close to the Norfolk border, the Virginia Beach campus is now home to several Jewish communal organizations that had once been located in Norfolk. These include the United Jewish Federation of the Tidewater, the Hebrew Academy Day School, the Jewish Family Service, and the Sandler Family Jewish Community Center. In 1980, the Beth Shalom Village retirement home was built in Virginia Beach. Yet ironically, as Virginia Beach has become the center of the area’s Jewish community, its congregations have been shrinking. Beth Chaverim has 155 families in 2013, while Temple Emanuel has about 180 – both are smaller than they were in the 1990s. Many of the Jews who have moved to Virginia Beach have maintained their membership in Norfolk congregations. Over half of the members of Norfolk’s Temple Beth El live in Virginia Beach. Even Mayor Meyera Oberndorf belonged to Norfolk’s Orthodox B’nai Israel Congregation. Today, the Jewish communities of Norfolk and Virginia Beach are inextricably linked as recent demographic trends have blurred the line between one of Virginia’s oldest Jewish communities and one of its newest.